I wish to map the brightness and contrast of an image into another image. 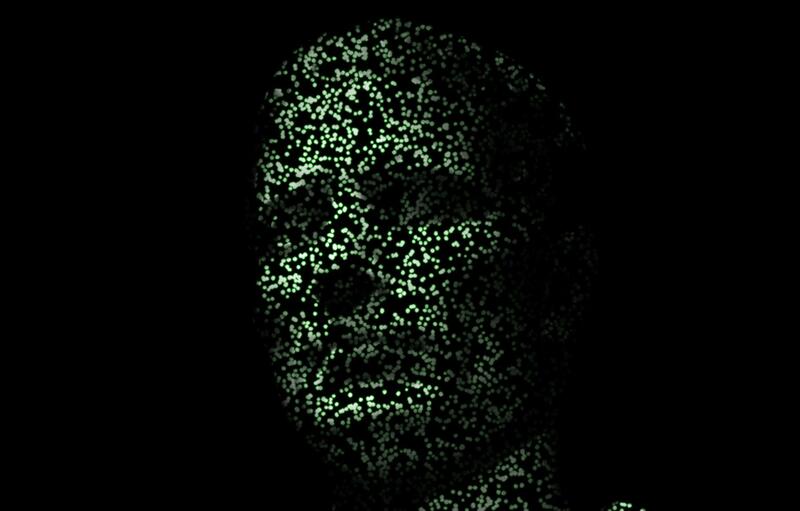 I have a grayscale photo of a face and an image full of glowing particles. 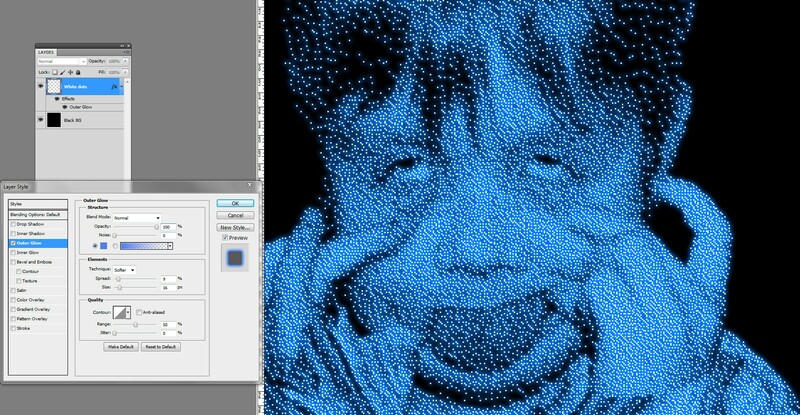 I want to embed the face photo to the particle image so that together they look like the face is made of those particles. The face photo I wish to use is a front view. All simple layering attempts fail, the result is only a face photo and particles combined to the same image, but they still are a separate face and particles. How the embedding should be done so that the result is like the face is made of glowing particles? ElementX is a new contributor to this site. Take care in asking for clarification, commenting, and answering. Check out our Code of Conduct. Your example is a textured 3D model or someone who has respectable 2D graphic software skills has warped an image to look out like it's a 3D model. There's a totally different way to build the face like it's made of glowing dots. 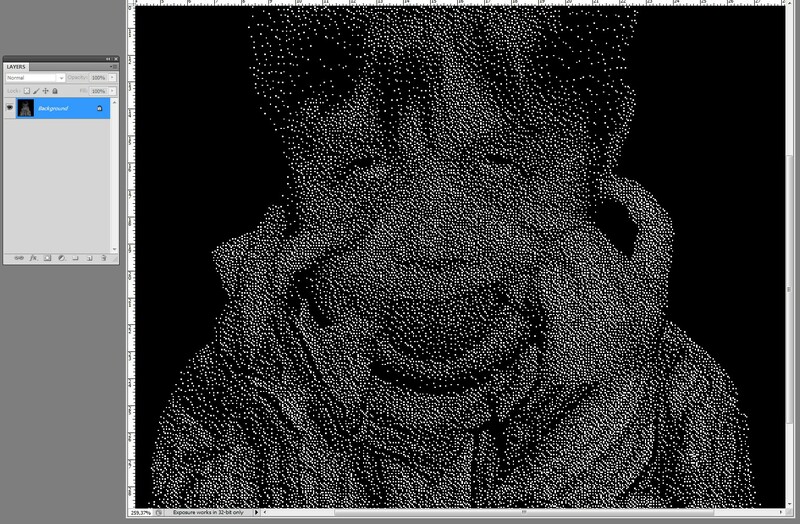 All dots are as bright, but their density varies along the local brightness of the face image. That's called halftoning. It's used in printing and in many drawing and engraving styles to simulate grayshades. 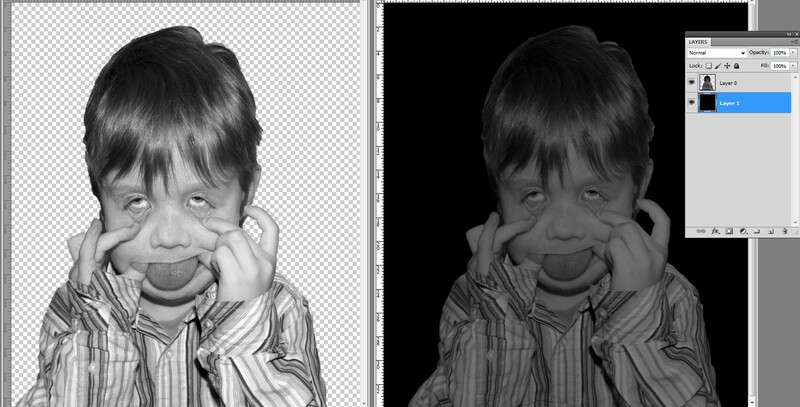 Photoshop has several high quality halftoning methods. One of them is Diffuse Dithering. To use it the photo must at first be converted to grayscale. The low contrast version has got full black background and it's max. brightness is about 40% of full white. It looks out grey, but the dots are full white on black. Zoom in to see it. insert Layer style "Outer Glow" to the white dots layer. If I understand your goal correctly, it's simple. 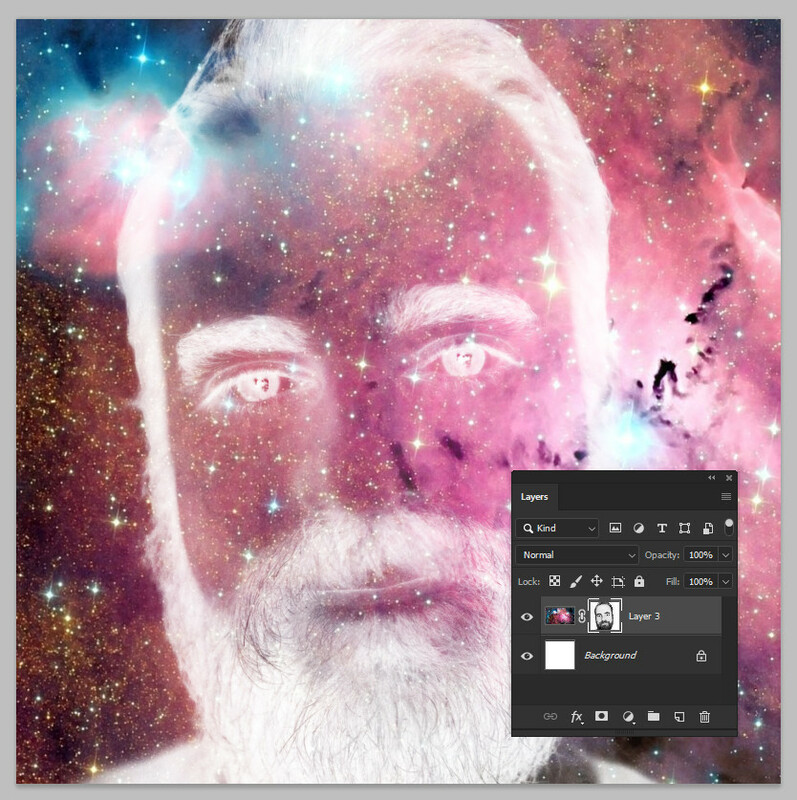 Just copy your face layer and paste it into the particle layer's mask, then invert the mask. Here is the image with no masking. 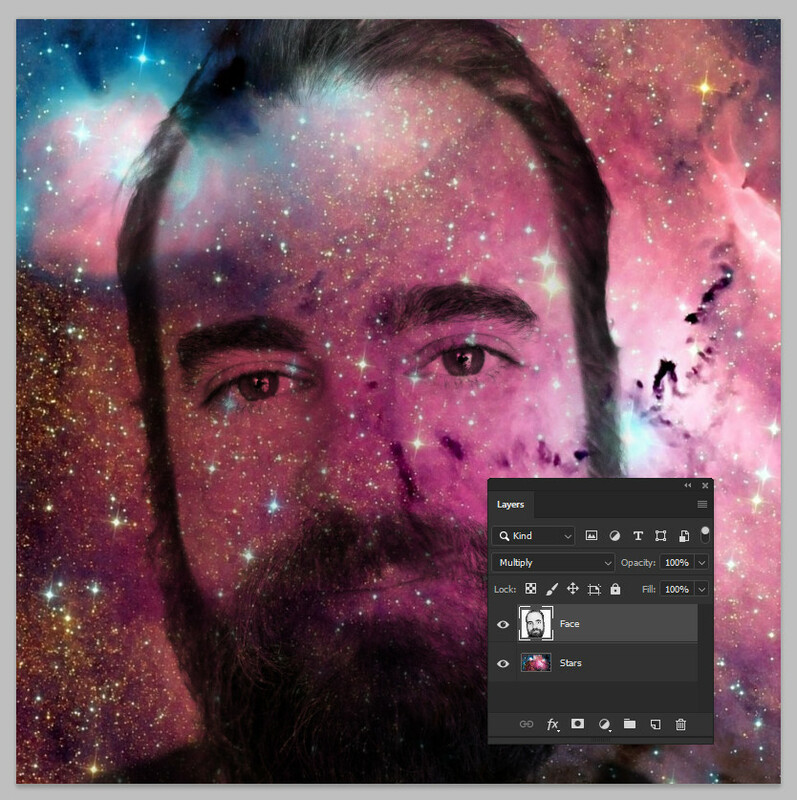 The face layer is set to "multiply" over the star background. You can try adding an exposure adjustment layer with a mask. Then copy that to get more contrast. For best result you probably need a photo with good contrast between shadows and highlights. I added a Color balance adjustment but that is not necessary. ElementX is a new contributor. Be nice, and check out our Code of Conduct. Not the answer you're looking for? Browse other questions tagged adobe-photoshop transparency photo-editing or ask your own question. 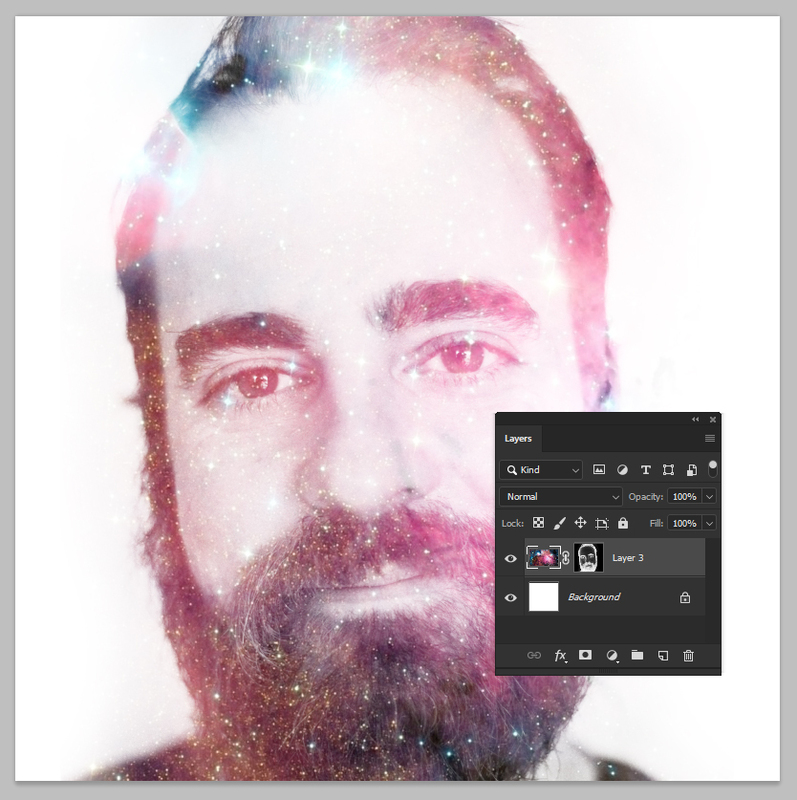 How do I match image brightness in Photoshop? How do I fix this photo (poor quality, saturation, color) in GIMP?